Biblical commentaries on earrings, makeup, contraception etc. The Bible promises Antichrists, strong delusion, false Christs and false prophets among others for the end-time people. There's no mention of purer teaching and better understanding of the biblical matters like many people tend to think. We read: Nevertheless when the Son of man cometh, shall he find faith on the earth? (Lk.18:8) Thus, it's important to understand how the early Christians lived their lives and how they understood the matters of faith. It may be shocking to many to understand that wearing makeup and earrings serve as a visible warning sign. Although such adornments are widely accepted in today's societies, they indicate those who have fallen away from the right Christian doctrine. The early Church Fathers held an unanimous view on such adorning. If all of the fathers were completely wrong, how could anybody today have a chance to be saved? In other words, if the doctrine was spoiled very early - even well before the First Council of Nicaea (325 A.D), wouldn't everybody have been accompanied with the same devastating errors ever since? All the Church Fathers unanimously denounced the use of makeup, hair dyeing and earrings. On the other hand, the Bible promises antichrists and spiritual darkness for the end time people. Today's false propets claim the opposite the Church Fathers taught. Who do you trust? Where's your foundation? Indeed the times have changed dramatically since the late 1800's and early 1900's. Today, it looks like any form of sin is accepted or even considered as pious activity. In addition, those living in the cutting edge of all the grave sins - like in Sodom and Gomorrah - are taken as idols and persons to worship. It was the year 393 A.D when the emperor Theodosius I, advised by the bishop and church father Ambrose of Milan, actually made the Olympics no longer possible to be held. Ambrose and Theodosius didn't overreact - even Martin Luther thought Ambrose was a real Christian sharing the same faith he did. However, the Olympics was introduced again in 1896. Yes, the Olympic games are again held every four years. The ending and restarting of the Olympics mark a period of rather a conservative era (393 AD - 1896 AD). Eversince, the mankind has been getting extremely liberal and secular at an accelerating pace. According to the Revelation, Satan will be released in the end - but have you ever wondered if he's been released already? Between the years 393 and 1896 the papal church of Rome had its issues and slipped off from the right Christian doctrine and went into hypocrisy. This spiritual Babylonian exile perhaps ended when Martin Luther brought proper doctrine for the public again. He himself wrote a book called "The Babylonian Captivity of the Church". Now it looks like the waves of sin will drown the most, just like in the times of Noah. It's said that there's two sides from the narrow path leading to heaven. One on the left, the other on the right. The left represents life in which various forms of sins are accepted, the right representing overly complicated ways of worship and utterly strict man-made rules related to religion. Today, the people are packed in the left - call it the spiritual Egypt. 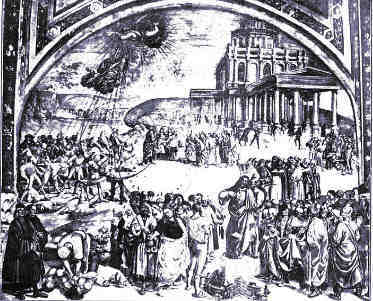 The papal church of Rome used to stand in the right, signifying the spiritual Babylon. Perhaps it has followed the mainstream and has lately entered the spiritual Egypt as well. The way to the glory is within the narrow path. 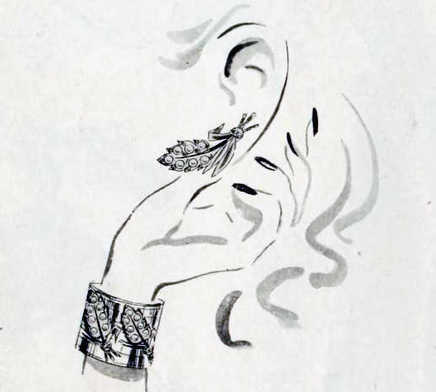 The mankind today believes that there's nothing wrong with earrings and makeup. They appear to be minor issues beside today's people of Sodom and Gomorrah. At the same time, the people are much more liberal than those a few hundred years ago. This intoduces the dilemma - how could today's secural people think they're correct without claiming all the early Christians were incorrect about the adornments, for example? Simply, true Christians even today don't wear such adornments. Don't be among the doomed. For you see, the Sodom and Gomorrah was not destroyed without purpose (Jude.1:7, 2.Pt.2:6) - similar sins are being promoted in today's societies. Hear the instruction: Come out of her, my people, that ye be not partakers of her sins, and that ye receive not of her plagues. (Rev.18:4) That is, repent! Jesus Christ said: "upon this rock I will build my church". The church is singular, not plural. There's only one true church. There are thousands of Christian denominations and sects built my men. They're far from being the true Church Jesus is building. Beware of the man-made churches, they won't save you. Posted January the 4th, 2018. biblenanalyses.com texts are all public domain free for all to copy and utilize. Sponsored ad: see also coding examples.